In "Canada Bound" on Life As I Live It, Squire tells us about picking up a bicyclist from Dallas who is on his way to Canada on a mountain bike, and giving him a ride to the other side of Little Rock. He was riding on I30, both illegal and dangerous as Squire points out, and I30 has no frontage roads through Little Rock. Man, used to be you could head out on the old US Highways on your bicycle, on foot, or perhaps on your trusty Honda Trail CT90, and see the country at a leisurely pace. On the cheap. Possum style. Anymore, all roads lead to the big cities, and those same US Highways disappear for miles, replaced by whatever Interstate happens to be going the same way. Interstates that ban pedestrians, bicycles, and anything that can't keep up with the hordes of aggressive drivers who will gamble with YOUR life for just one more carlength closer to wherever they're going. Interstates that people in cars die on everyday, nevermind what could happen to those on a bicycle or a 50 mph small motorcycle. Things are better these days, in some ways. Worse in others. For quite awhile now, I've been looking at those cheap 2-cycle portable generators, and wondering just what they are capable of; and more to the point, will they start a small air conditioner? Well, look what showed up on my front porch today! I plan to put it through its paces, see if it will indeed run a window unit air conditioner, etc. Then I'm gonna write a review, right here. I have looked all over for a real-world article about these little units, to no avail; so I'm doing something about that. My initial impression is that it has the look and feel of quality. BTW, I didn't get the absolute bottom-dollar, $89 version that some places have, nor do I link to those. I've seen some bad reviews of those. Instead I got what appeared to be a higher-quality generator, with a one-year warranty, for $129. That's the one I link to in my store, for the same reason. I had to pay the same price you do if you buy one, too. I don't get a discount. I hope that if it performs well for me and you decide to buy one, you will buy it from my store; but my primary motivation is to have fun, learn a thing or two, and write good articles about it so you will want to keep coming back. So keep watching this space and I'll share whatever I find, good or bad. P.S. The Mini-Maglite is for scale. How about this for a vegetable oil powered generator? Man, if I had this I'd have to just sit and watch it run for awhile, every day! While generating electricity, of course. I guess I'm better off with my Lister, though. This thing makes 52 horsepower. I would have to build more structures, just so I could air condition them! Of course, as slow as it is, I could probably get it to run on sawdust! This [Link] is pretty cool. A producer-gas fueled truck in the Australian outback. For those who haven't heard of it, producer gas is gas that is produced by heating (in a closed container) wood, charcoal or other biomass fuel. The fuel must be cooled and filtered before use. This technology has been used since before gasoline was readily available, and some farmers used producer gas in their trucks and tractors during WWII. This is similar, but not the same, as methane gas, which is produced by bacterial action and can be used for the same purposes. It seems to me that this technology would be best used to run a generator or other stationary engine; but these folks proved that it can be used for transportation as well. 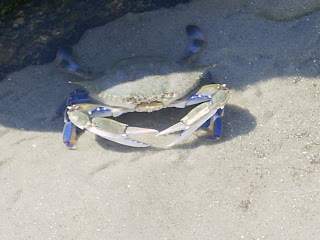 It's blue crab season! 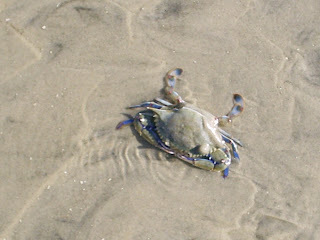 Blue crabs are found along the Atlantic and Gulf coasts in the US, and summer is the time to catch them. My preferred crabbing areas are the more secluded spots on the Atlantic coast in the Carolinas and Georgia. You can find them in calm bays and inlets, the soundside of islands, rocky shorelines, and under piers. They are easy to catch, too. The easiest way is to use a crab trap, but if you don't have one and are trying this for the first time to see if you like it, you can just tie your bait (chicken skin, necks etc. works well) on the end of a string, and let it sit on the bottom. When you feel a crab pulling on the line, give it a few seconds to become engrossed with its meal, then slowly raise it to the surface. As it approaches the surface, be ready with a net because it will probably let go when it sees you! A throw net is another way to catch them, and I believe that is a common method used in Louisiana. You tie the bait to the net in several spots, lay it out on the bottom, and draw in the net after about 15-20 minutes; hopefully complete with crabs and perhaps a few other edibles as well. When using loose spices, I add them a little at a time, pretty much continuously. If you add all the spices while the veggies are boiling, the veggies could absorb most of it, leaving little for the crabs. I throw the veggies in first, starting with the spuds, and let them boil about 10 minutes before putting in the crabs. You can probably start taking the corn out before you put in the crabs. After the crabs cook for about 10 minutes, dump the whole works out onto a newspaper-covered picnic table or the like, and dig in! If you like beer, make sure you've got plenty of that ready. Oh, and invite plenty of friends for the whole shindig. What is Burning Man? It defies explanation, but this link to the official site is a good place to start. * Things you would like to do and bring IF you have time and space"
I got a laugh out of that, because when I am planning a major camping trip, to Terlingua for example, I spend weeks making lists of everything I'm gonna take. I have plans about how I'll get some things packed into my Jeep a couple of days beforehand (so as not to be doing everything at once), finish the packing the night before, except for a few things I'll need on the way out there; then get up at zero-dark-thirty, eat breakfast, grab the last few items, and be on the road before traffic gets bad. Then, what I actually do is spend the night before dragging out everything I think I'll need, inventorying until 1 am before collapsing in bed, get up at 8 :30, and wrestle with packing, finally rolling out at 3 pm, already dog-tired and wondering how many absolute essentials I left behind. Then I drive until 3 am to make up for lost time, get 5 hours of sleep and hit the road again. I want one of these in a pump action! I know, it's not really soup season; but last weekend I had barbecued chicken, and rather than throw out the bones and other stuff that didn't get eaten, I made soup stock out of it. Then, today I was taking it out of the fridge and packaging it to go in the deep freeze, and I started noticing all the formerly fresh garden produce I had lying around. One thing lead to another, and I was in one of my "peasant food" moods, and throwing all kinds of stuff in the crockpot. I probably have less than fifty cents in the whole pot. The only storebought thing in it, besides spices, is a double handful of rotini. Recipe? We don' need no steenkin' recipe! I just finished a bowl a few minutes ago; I'll probably save out a couple more bowls and freeze the rest. On this date in 1789 [Link]. These folks are having a good time. It doesn't say where they were, just that it was one of their regular family camping trips in the desert. I remember back in the '70s, these things were advertised in the back of magazines as kits that you assemble. I've only seen one in real life; it was a trike with a flatbed. That would be pretty handy to have for hauling firewood, etc. offer several different versions, including an outfitter-grade unit using a deep-cycle battery and a 20 lb propane tank, that rivals on-grid showers. They're pricey, but worth it for a long-term base camp or an offgrid home without standard indoor plumbing. winter, the woodstove. Paint it with black spray paint, and you can set it in the sun to warm, in warm weather. Once the water is hot, replace the pump assembly, pump it up, and shower away! even use a real shower head with a pull-chain. One thing you don't want to do, however, is use a shower head that runs continuously while you stand under it; otherwise you will run out of water. sprayer, which I used in the standard bathtub with shower curtain. Because it was plastic, I couldn't heat the sprayer directly, so I heated my water in a stock pot on the stove, before pouring it into the sprayer. That plastic sprayer was able to withstand higher water temperatures than I could! A gallon and a half was plenty for a long, luxurious (as Navy showers go) shower, and if pressed I could easily get by on less than a gallon... Take note, desert dwellers! By the way, in case you are wondering: no, I didn't have running water in that trailer. I did have a plumbed greywater line from the tub, and a standard toilet and septic tank, which I flushed with water from a bucket... But that's for another article. Note: If you try this, use a new sprayer; not one which has had chemicals in it. Here's one of the reasons why China is going to kick our asses on the global market in another fifty years. I've been reading up on the development of the Chinese economy, and the strides that ordinary Chinese make to assure they become more than running shoe stitchers for American shoe companies in the future. They love education over there. School is serious business in China. They learn math and languages at higher levels much earlier than American students. They also have a massive thirst for English language instruction. Learning a second language is desirable to them, and they seize the opportunity if they have it. Contrast that with the attitudes towards bilingualism in the United States. I recently read an interesting article about a pilot program in a San Francisco kindergarten, where the students received immersion in Mandarin Chinese for an entire year. They had a Chinese teacher who spoke nothing but Chinese to the kids from Day One, and at the end of the year they communicated with the teacher (and each other) in competent Chinese. I made the mistake of mentioning this program on a conservative-leaning online discussion board, and the responses were overwhelmingly negative, by a ratio of ten to one. This is America, I was told. In America, we speak English, or we are encouraged to go back to whatever furrin place we came from. We don't need to learn no Chinese--they're learning English, after all, and the whole thing just sounds like another liberal attempt to enforce multiculturalism. Press "one" for English, or get the *expletive deleted* out of the country, yessir. This is why our economy will be left behind. It's not just because the Chinese are willing to work for less money--it's because they value education, and they recognize the importance of making yourself competitive for the world market. We're going to be left behind because we dumb down our education system, and because we whine that we deserve twenty-dollar-an-hour union jobs--and by golly, we should have the right to make those companies who outsource their labor stay in the United States, because if a corporation is based here, they have the duty to hire Americans above anyone else, even if that American is half as educated and paid ten times as much as his Chinese counterpart. The sense of entitlement that has permeated every fiber of the American quilt naturally extends to the workplace now, and this is where the so-called Conservatives fall right in lockstep with the Socialists they despise. That's when you find them all clamoring for government regulation of private business, because it's simply not fair/patriotic for a business owner to hire foreigners over his own countryfolk just to make a profit. It's kind of funny that a country which officially embraces capitalism would cripple itself economically by embracing socialist attitudes about work (the right to an income, national allegiance above profitability, government control of the flow of goods), and a professed socialist country would increase its economy exponentially by embracing capitalism and free market principles. In the age of instant global communication, you simply cannot turn up with your diploma from Mediocre State College and expect it to be a voucher for a 90k-a-year white collar job. The white collar jobs are increasingly being picked up by people in Bangalore, Mumbai, Peking, and other places where education hasn't been dumbed down to the point of being the punchline to a joke. The blue collar jobs have already been picked up by the uneducated folks in those countries about twenty years ago, when their American counterparts still insisted that a person needs to be paid a healthy union wage for turning the same screw or hitting the same button all day long. Nearly 25 years ago, my parents visited Germany and brought me back, among other things, a Victorinox Swiss Army knife. It's not exactly like the Super Tinker [Link] available on the American market, but it's very close. Since I received it, I have carried that knife pretty much every day, and I use it numerous times during the day for a variety of chores. It has always performed flawlessly, and holds its razor-sharp edge very well. In fact, it's one of the few stainless blades I like. That is why, when I decided about a year ago that I needed some new kitchen knives, I decided to try Victorinox. The results have been just what I expected: superb. The steel is the same as my old Swiss Army knife, and cuts and holds an edge just as well. These knives are quite affordable, yet are still made in Switzerland with traditional Swiss quality; unlike the Chinese blades being sold by most American and even some German knife companies. Don't get me wrong, I'm not above buying Chinese goods. One of the tenets of Possum Living is finding the best combination of price and quality that I can find. After all, I'm paying my hard-earned money for equipment that has to fulfill a need, not make a political statement. If that product is made in China and is of acceptable quality, so be it. On the other hand, when I can get Swiss quality for a reasonable price, so much the better. That is why the cutlery section of my store [Link] is heavily weighted with Victorinox knives. This is the kind of four-wheeling I like: expedition style, not exhibition style (i.e. blasting through mudholes or rockcrawling for its own sake). Actually going somewhere in the boonies, preferably multi-day (or -month, even) and camping every night. I also liked the use of aluminum treads (aka ladders) to assist in traversing tough spots. I remember seeing pictures and reading about their use in Camel Trophy rallies in the '80s, but had never seen an actual video of their use. BTW, speaking of the Camel Trophy; I don't know how many of you remember that but it is my all-time favorite motorsport. Uh Clem is one of the characters featured in this post [Link]. I love the song he's playing. It's called "No Expectations" and is featured on the 1968 Rolling Stones album, "Beggar's Banquet". This is a video about some of the characters in Terlingua. If you haven't read it yet, check out this article [Link] I wrote about my first visit to Terlingua. It's one of the last, best places in the US. Ojinaga is in the Big Bend, and is the nearest legal border crossing to Terlingua. Locals on the US side call it "OJ". OJ has a webpage, here[Link]. These shots are of the area just outside Ojinaga. Now THIS is how a Unimog is supposed to perform!